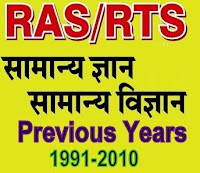 Rajasthan Admin Services (RAS/RTS) PRE Examination Solved Question Papers of year 2010 for General Knowledge(GK) and General Science. Tips by www.rasexam.com: Fourth Buddhist Council was held in the Sarvastivada tradition, said to have been convened by the Kushan emperor Kanishka, in 78 AD at Jalandhar or in Kashmir. 9. During Akbar period Land revenue system "Ain-A-Dahsala" was developed by"
from where i can get RAS Pre past years exam papers in hindi? answer is belgaon, mahatama gandhi's 1 and only 1 session in which he attented it as president. "Gaya" is definitely wrong answer.